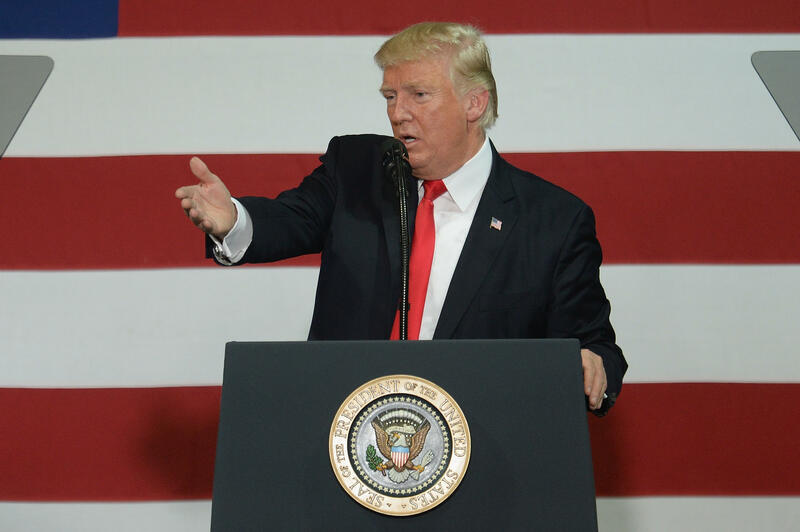 The Trump administration's proposal for changes to the tax code will reduce the number of individual tax brackets, eliminate most personal deductions and lower corporate tax rates, according to senior administration officials. With Senate Republicans' last-ditch attempt at health care reform dead, the GOP is pivoting to another policy arena in which it hopes to find more success. But the White House is leaving many of the details to the House Ways and Means Committee and the Senate Finance Committee. Senior administration officials told reporters on a conference call Tuesday that the goal is for the tax changes to create a larger "zero" tax bracket, and be "at least as progressive" as the current system, all with the "middle class in mind." The proposed plan reduces the number of individual tax brackets from the current seven to three, with the lowest bracket jumping from 10 percent to 12 percent, the highest tax bracket falling from 39.6 percent to 35 percent, and the middle bracket coming in at 25 percent. But it's anyone's guess who will pay those rates. The administration is leaving the income limits to accompany those brackets up to the House and Senate tax-writing committees. The administration is also leaving wiggle room for the committees to devise a higher bracket north of the 35 percent rate for the wealthiest individuals and families. The administration said it was eliminating most individual credits and deductions, and touted the near-doubling the standard deduction from $6,350 as of 2017 to $12,000 for a single person, and from $12,700 as of 2017 to $24,000 for a married couple. The White House also wants to increase the child tax credit, which now tops out at $1,000, but it is also leaving the details of any increase up to the committees, too. The White House does want to raise income limits for the credit so more families qualify. The administration also intends to add a $500 tax credit for non-minor dependents, such as an older adult parents are caring for or an elderly grandparent who lives with the family. The deductions the administration intends to keep are for mortgages and charitable contributions, although the White House is urging the House and Senate committees to incentivize retirement saving. The administration's plan eliminates the deduction for state and local taxes, one of the changes likely to cause the most consternation for those in high-tax states like California, New York and New Jersey. The plan also repeals the estate tax, sometimes referred to as the inheritance or death tax, a tax levied on property transferred from a deceased person to his or her heirs. Taxes on businesses will also changes, the administration officials explained. The new top tax rate for small businesses will be 25 percent. For corporations, the tax rate would decline to 20 percent — slightly higher than the 15 percent Mr. Trump has mentioned, but significantly lower than the current rate of 35 percent. In exchange for the lower rate, the White House wants to eliminate the corporate Alternative Minimum Tax. For companies with an international footprint, the White House is also proposing a shift from the current worldwide tax system to a territorial system. A corporation in the 35 percent tax bracket repatriates $1 million of income earned abroad, it would owe $350,000 in U.S. tax. But it has already paid $200,000 in tax to the country where the income was earned at that country's 20 percent rate. It would owe the U.S. government another 15 percent ($150,000) in order to bring the total tax paid on the $1 million of income to the U.S. 35 percent tax rate. A territorial system taxes companies only on the profits they earn within the country in which they are based. The administration's plan would allow companies to repatriate their offshore profits back to the U.S. without incurring additional taxes. To make the transition, the White House is proposing a one-time tax on profits that have accumulated overseas, with two different tax rates applied -- one for liquid assets and one lower rate for illiquid assets. The one-time tax would be payable over several years. The White House pointed out that the U.S. is one of only six OECD countries which taxes its companies based on a worldwide system, rather than a territorial system. Mr. Trump announced the rollout of his tax plan Wednesday afternoon in Indiana. CBS News' Jackie Alemany contributed to this report.